Mater operation: The Australian-first spinal operation on a baby diagnosed with spina bifida while it was still in the womb. BRISBANE doctors have successfully performed an Australian-first spinal operation on a baby diagnosed with spina bifida while it was still in the womb. A team at the Mater Hospital carried out the operation on a 24-week-old in-utero baby on July 23. “The surgery went as well as we could have hoped and both mother and baby are doing well,” Mater Maternal Foetal Medicine director Dr Glenn Gardener said. Spina bifida is a condition where the lower part of a baby’s spinal chord is exposed. It affects one in 2000 pregnancies in Australia. Families often discover the diagnosis of spina bifida at their 18 to 20-week ultrasound scan. Until now, Australian parents have had to wait until the baby is born to perform surgery, or travel overseas for in-utero surgery. 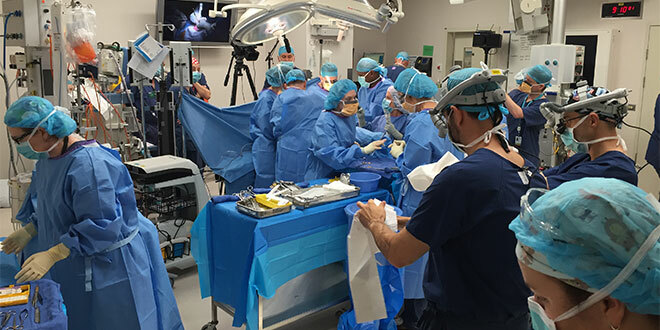 Doctors from Vanderbilt University Hospital in Nashville, Tennessee, who pioneered this type of prenatal surgery for spina bifida, assisted the Mater surgical team. A seven-year trial in the US (MOMS study) demonstrated clear benefits for babies who underwent prenatal in-utero surgery to treat spina bifida compared to cases where surgery took place after the baby was born. Cherish Life Queensland president Julie Borger said the successful operation had direct implications as the state’s politicians considered whether to support a bill to decriminalise abortion up to the time of birth. “Currently there are late-term abortions occurring in our Queensland hospitals on children who have been diagnosed in utero with an abnormality,” Ms Borger said. “If the Abortion Law Reform (Women’s Choice) Bill 2016, currently before the Queensland Parliament, is enacted there will be many more. “This bill will allow an abortion right up to the expected date of delivery on a child for any reason at all. “These pre-born children’s intrinsic value will be denied or overlooked if their existence threatens the convenience of the already born. During the Mater surgery under anaesthesia, the uterus was cut from the mother’s stomach, turned, and an incision made. Fluid was then inserted so the baby floated to the top of the uterus, exposing the spina bifida. “While this surgery isn’t a cure for spina bifida it does significantly improve the outcomes for babies with spina bifida and I’m delighted we have been able to perform this surgery, saving them the added stress of travelling overseas to access this treatment,” Dr Gardener said last week. The Mater Hospital hopes to establish itself as an Australasian hub for the procedure.